No one is insured from disability, and I don’t want to focus on what kind of disability is more or less difficult. But one thing is obvious: it has influence not only on life of the person with disability but also his/her family members. 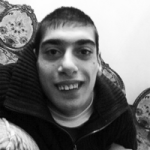 I am 32 years old and I have cerebral palsy: I can’t move my limbs and I need continuous care. I try to live full life. I have many hobbies starting from arts to sciences. I have received excellent home education thanks to my teacher Mrs. Baghramyan. Then I self-educated myself. With the help of my family I have got more interests, and computers attracted me like everybody else. Since 1995 to now it’s my main occupation. I can’t imagine my life without it. You may think how I can use computer when I cannot use my limbs. This story is all about how a little device changed my life. Until 2013 it was really difficult for my relatives: my mother or father were always helping me by sitting all the day with me near computer. Sometimes they were joking that they are my captives. Once I’ve read in Internet that Chinese Lenovo and Swedish Tobii companies have created a conceptual notebook with infrared cases, which give opportunity to play a game exclusively with eyes. I want to confess that it was the most hopeful information of my life. It was called Eye Controlled PC. I have remembered that. 2 years passed. On evening in January, 2012, my brother told to me: “Dav, Windows OS has alternative Voice Control, let’s try it.” We have tried, but it was hard for me because I also have speech difficulties. And I have told him about device that I have seen two years ago and which was already producing by Tobii. The first generation of device was big and the cost was $7000 included taxes. One year passed, new generation came out which was more compact and was called Tobii PCEYE GO. It was compatible with all Windows operational systems. As the amount of money was big, we have tried to find benefactors but it was useless. I know that I’m not the only one with disability, but that device could really change my life. And really, this is life changing device.